At this year’s Cannes Film Festival, Poland celebrated a big win with the Best Director Award going to Pawel Pawlikowski for his historic love story “Zimna Wojna” (“Cold War”). Yet Poland is no stranger to success in the film business, having emerged as a cinema champion over the past few years with the largest market in Central Europe. In 2017 box office increased 10.8%, as admissions went up 8.7% and local films dominated the top five with three titles and a healthy 23.2% market share. With a screen density of just 35, compared to 66 for UK, 76 for Spain and 91 for France, there is still major potential for growth, especially when it comes to per capita admissions which are just 1.5 visits per year. 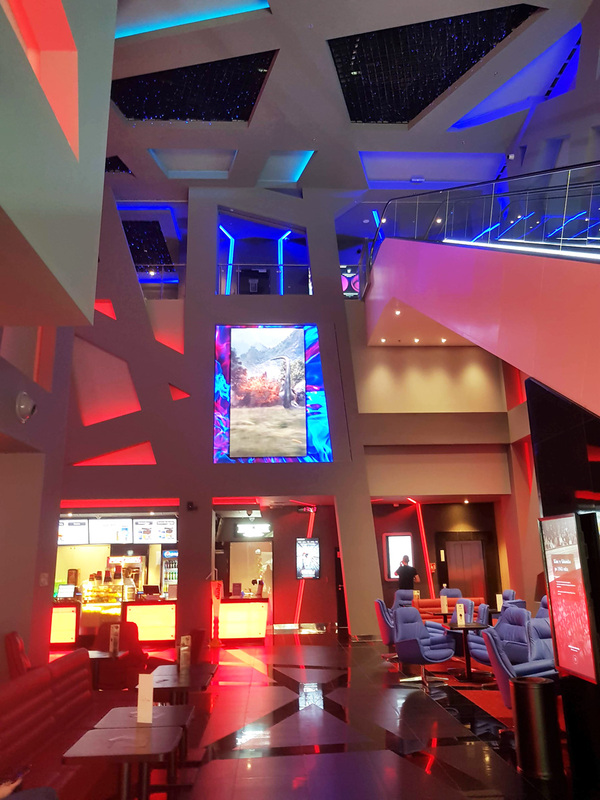 Much of the country’s growth has come from the rapid pace of new multiplex openings, with three chains dominating the landscape: Cineworld’s Cinema City, Vue Multikino and Helios, owned by Polish publisher Agora SA. The latter is also the parent of the Gazeta Wyborcza newspaper. 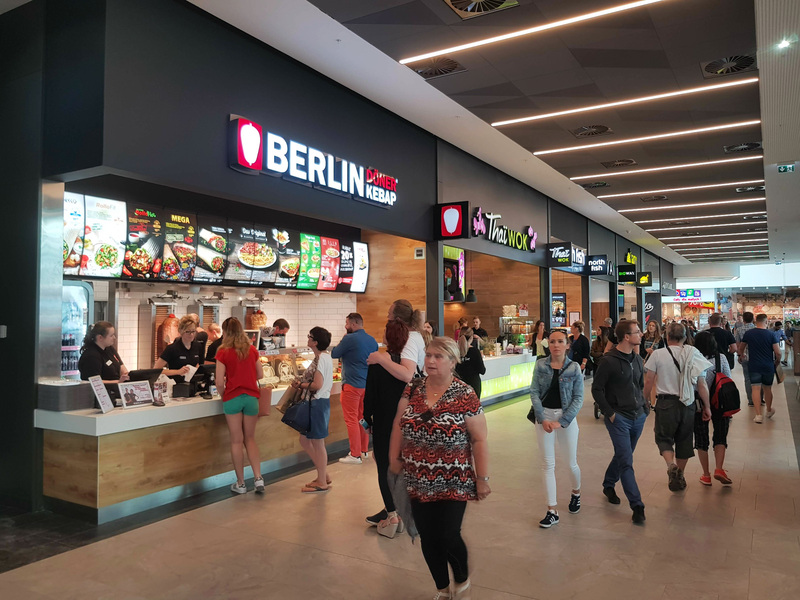 Interestingly, Agora is divesting its television interests and instead investing in fast casual dining, clearly seeing value in out-of-home food and entertainment propositions. 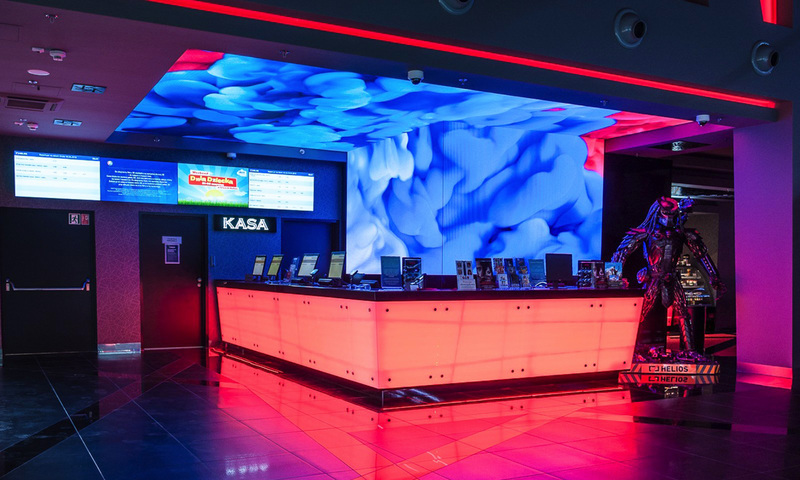 The importance of the Polish market was confirmed in August this year when Vue acquired Cinema3D and its 14 complexes. Yet Helios remains resolutely independent and with a focus smaller town and villages. 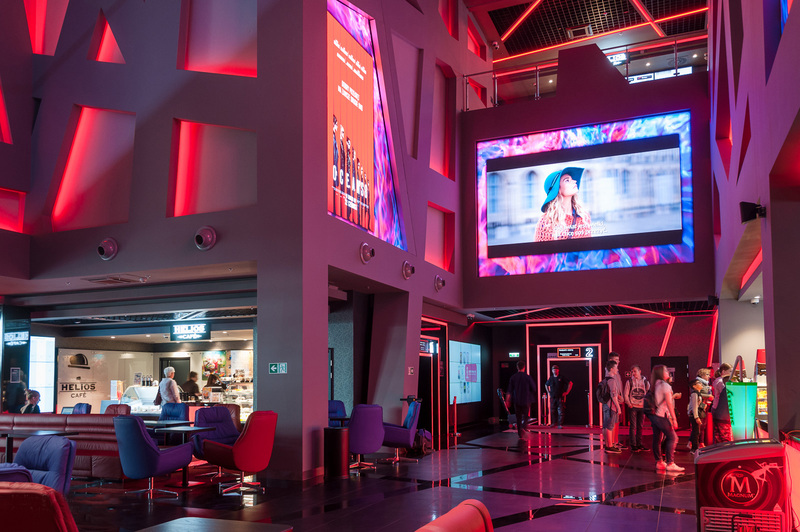 This is now changing with its first cinema opening in Warsaw’s Blue City shopping centre in Q4 this year, adding to sites in cities such as Lódz, Wroclaw and Poznan. 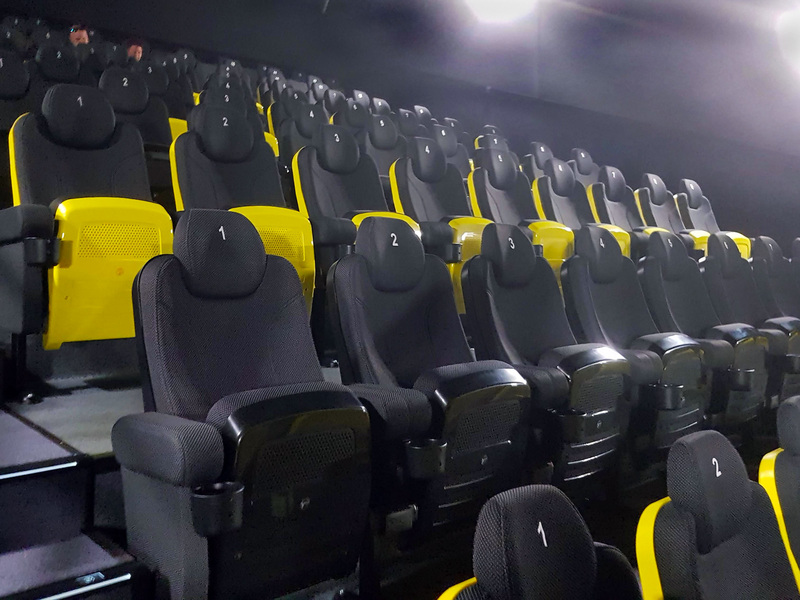 In total Helios network has 45 cinemas, 253 screens and over 50,000 seats. 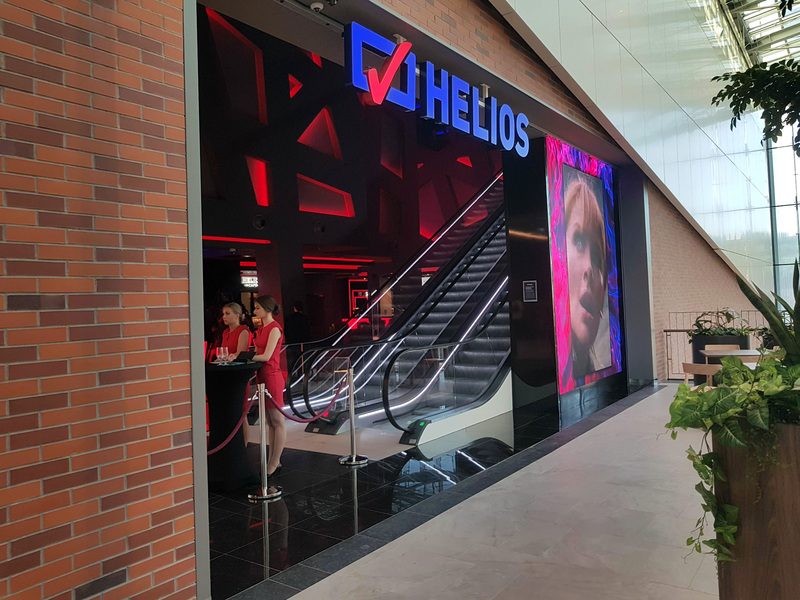 Celluloid Junkie was able to attend the opening day of Helios’ newest multiplex in the port city of Gdansk on the Baltic Coast. 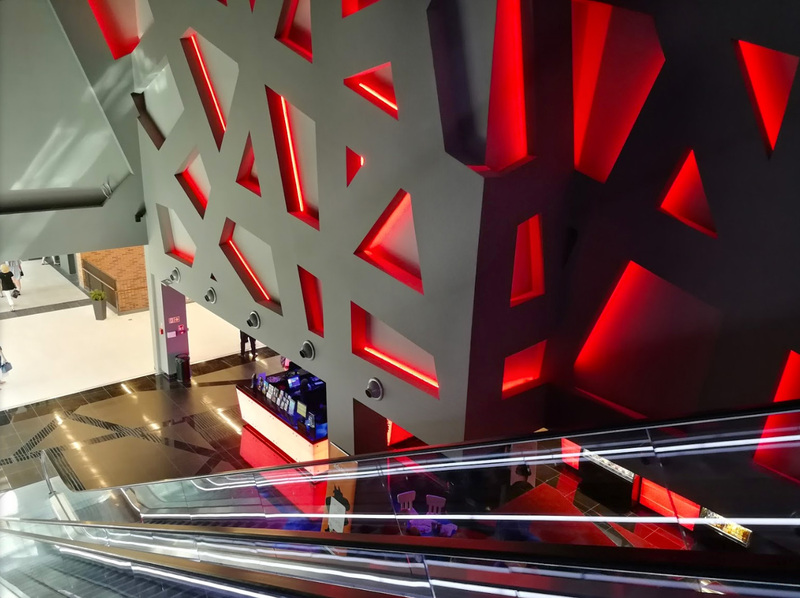 The multiplex is located in the Forum Gdansk shopping mall, which was also celebrating its opening week. 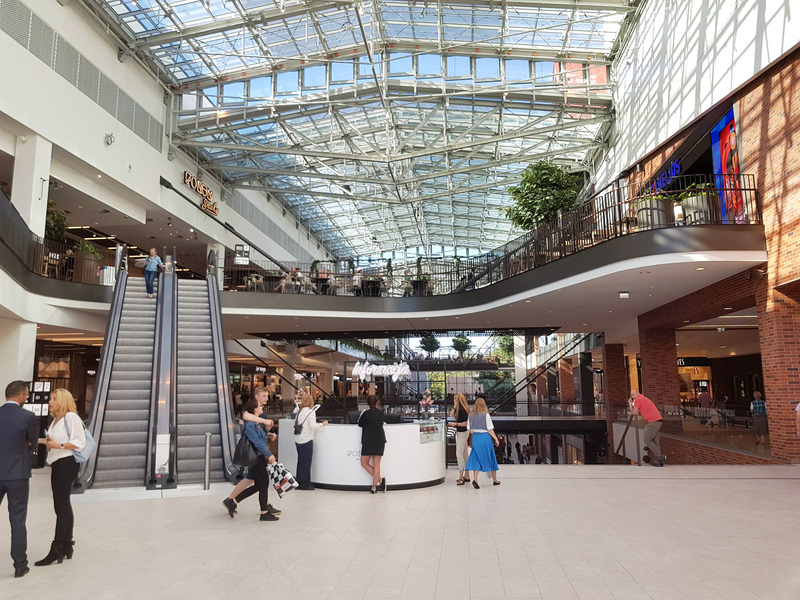 The big and airy glass structure lies just one stop on the train from Gdansk Central Station with 24 hour parking for cars and bikes, free Wifi, children’s playground, family rooms and even breastfeeding rooms. Adding to the ambiance, one-third of the centre is green areas, both indoors and outdoors, including two trees and 33,000 plants made up of 80 different varieties. There are over 100 benches for those exhausted from shopping and eating. 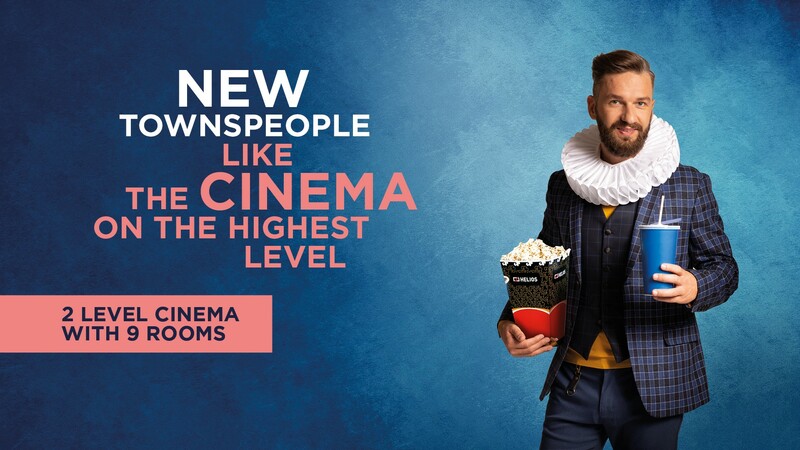 The shopping centre offers four floors of boutiques and 21 different restaurants, fast food franchises and coffee bars, so any cinema faces fierce competition when it comes to competing on fronts other than just popcorn and soda. 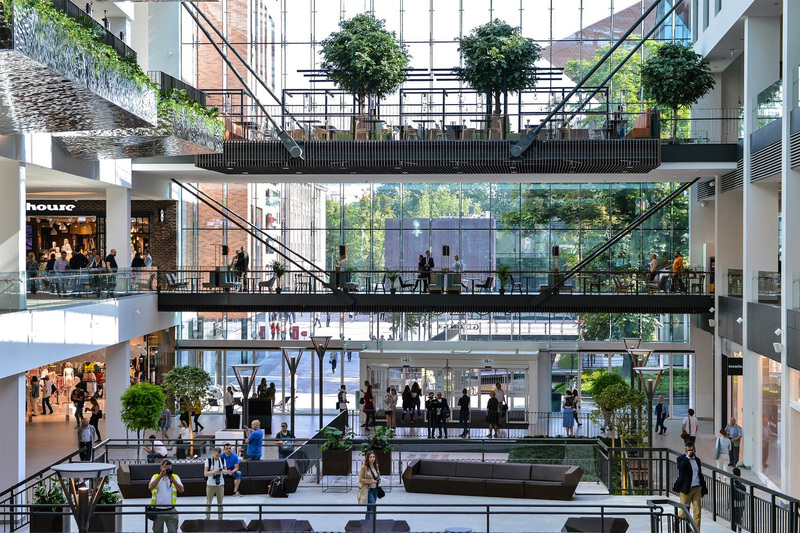 Forum is proof that one doesn’t have to go to Asia or the Gulf to see the latest developments in location-based retail. The Helios multiplex is located on the upper floor of the Forum to the left as one enters, directly opposite the food court. 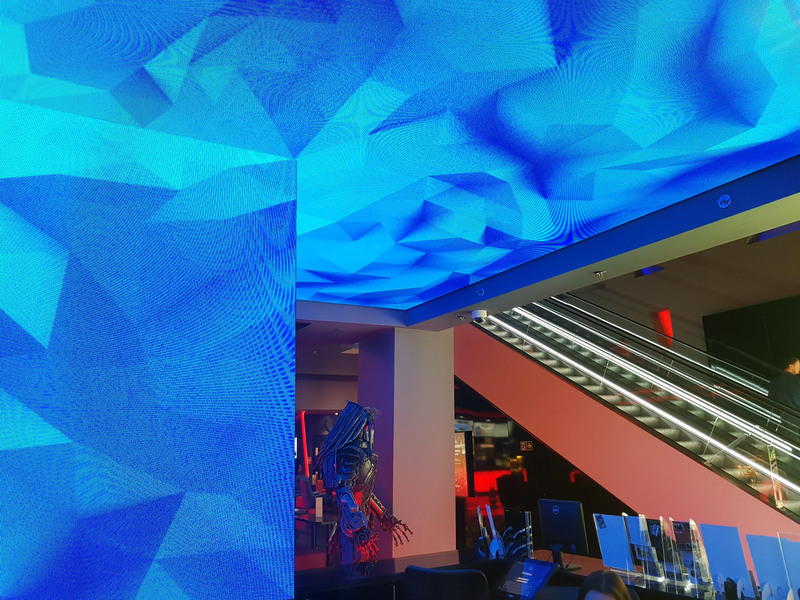 It has big eye-catching LED screens, including a ceiling feature that fuses with the panels on the wall for an impressive effect above the box office. 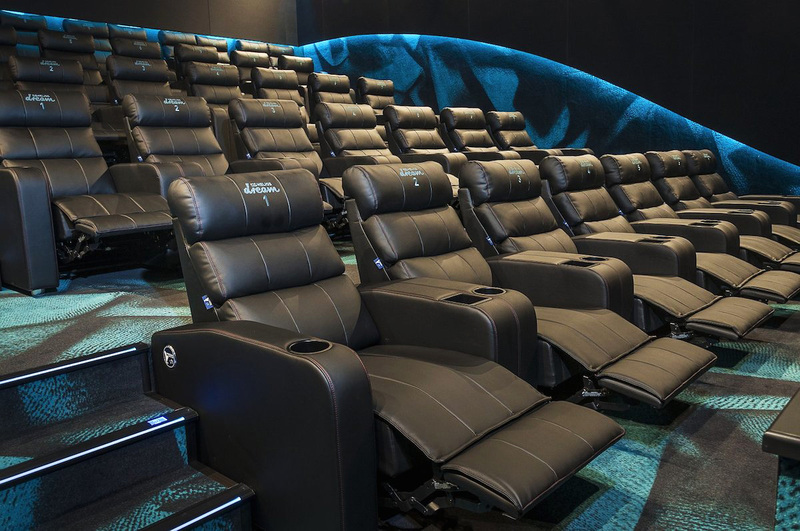 The cinema has a total of nine screens with 1,100 seats in total, including the new Helios Dream concept (more on this later). The staff at the box office are as friendly as the Predator standee statue next to them is intimidating. The foyer is large and inviting, with plenty of seating to attract people to come early and enjoy the extensive food and beverage options before any film. 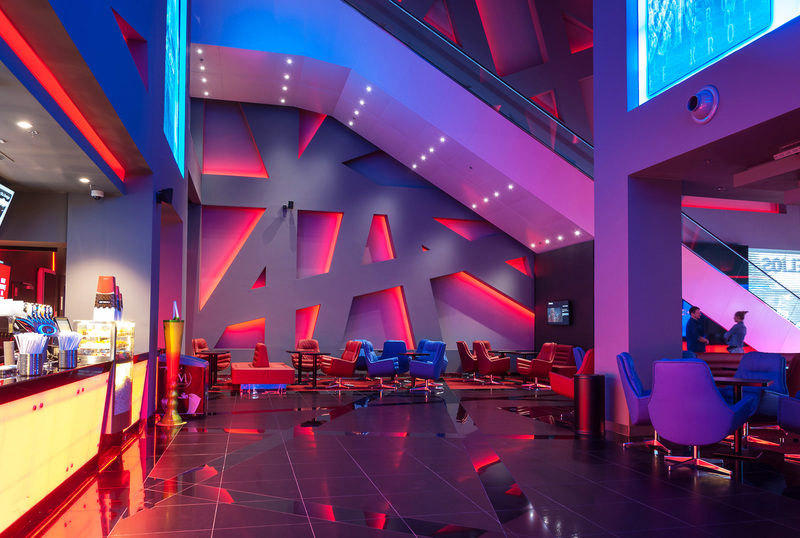 The blue and red chairs and sofas were matched by the shifting blue and red lighting scheme. 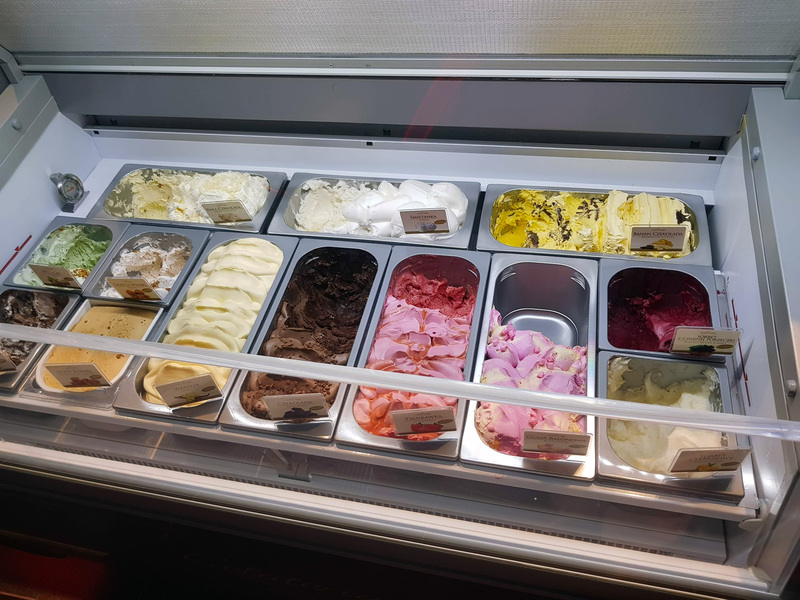 There is a dedicated Helios Café coffee bar with a large selection of sweet treats – muffins or panna cotta for international palettes or local treats such as sernik (cheese cake), szarlotka (apple cake) or galaretka owocowa (fruit in jelly), as well as scoop ice cream. Helios has not outsourced the cafe but runs the establishment itself, with the women serving making up in friendliness what they lack in speed compared to a Starbucks. However, the coffee had a slight bitterness, which may have come from the machines being brand new. 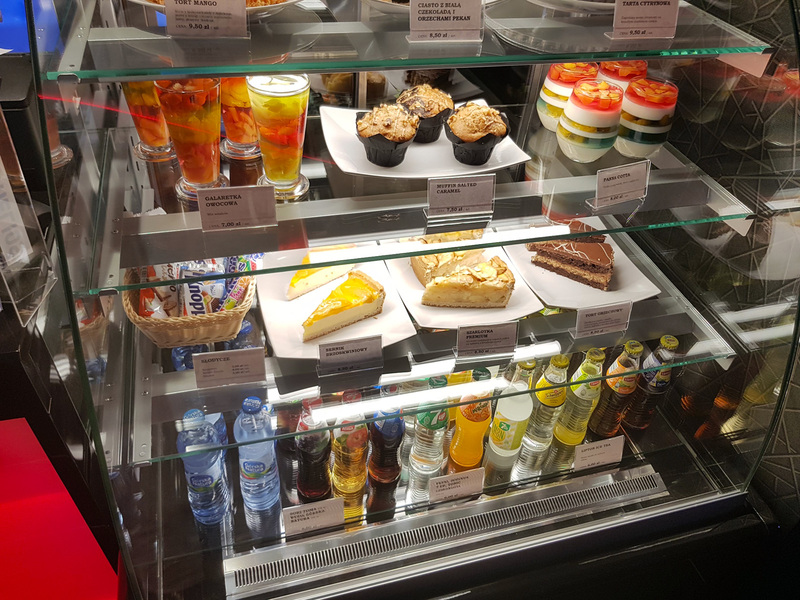 The long concessions counter is well stocked and standard, with few surprises (except Pepsi, rather than Coke). Popcorn is made fresh with a crisp taste, including combo offers for both popcorn, nachos, sweets and drinks. Service is friendly and efficient. 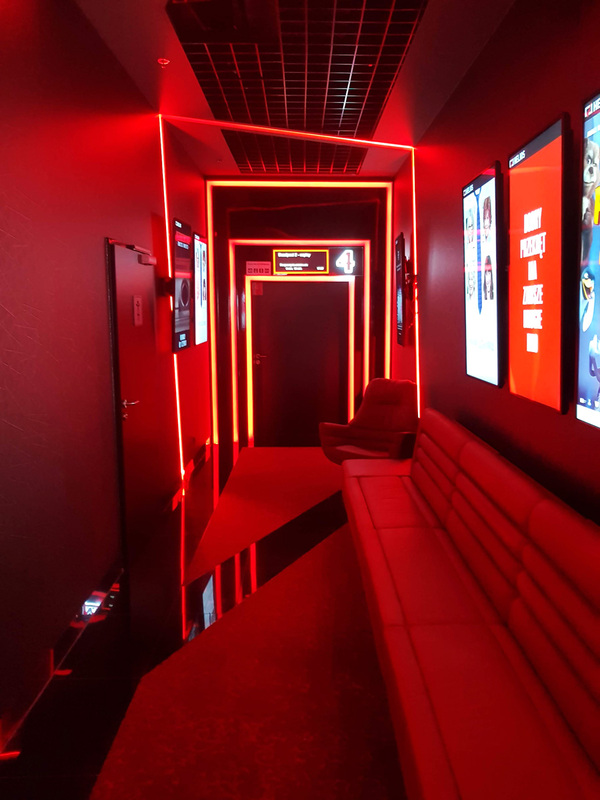 The corridor leading to most of the screens is an immersive experience with red lights zig-zagging the walls and ceiling. 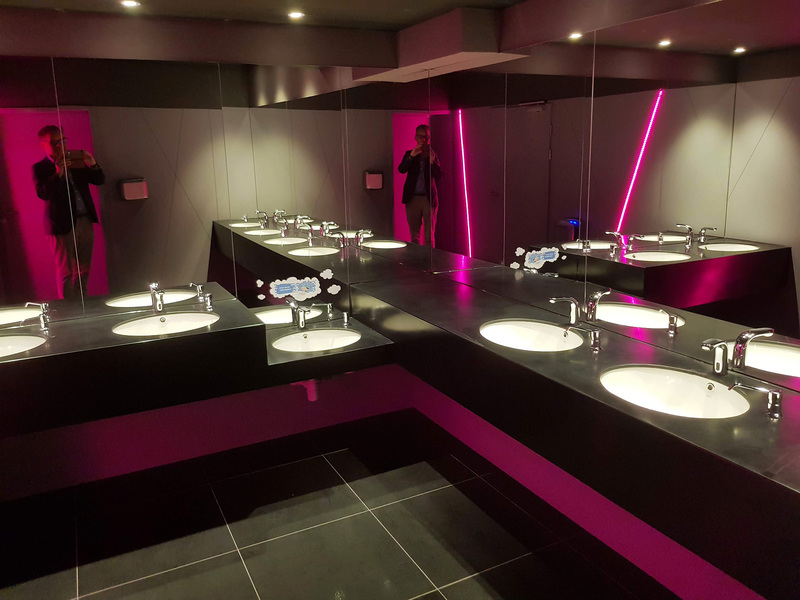 The effect is taken even further in the toilets, where the lights constantly shift from red to blue to purple. 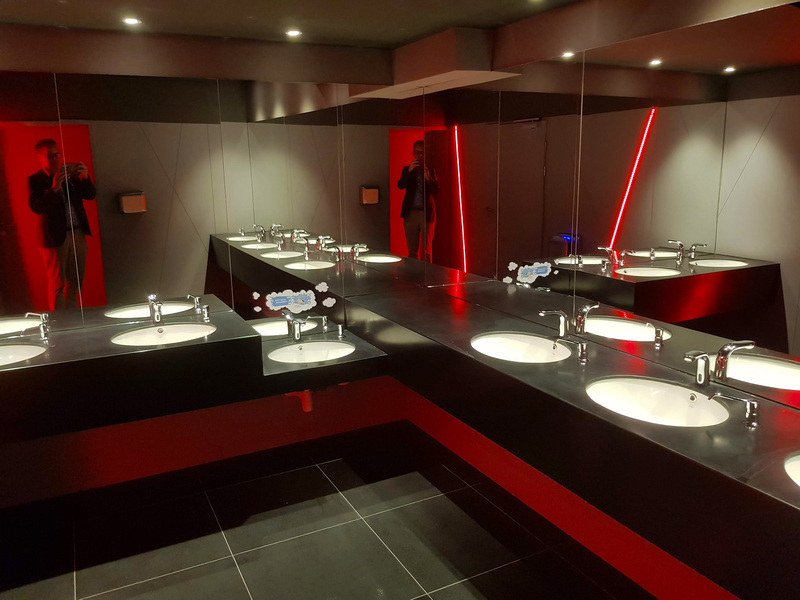 The lighting scheme in the whole cinema is pleasingly designed, including small touches such as the discreet auditorium emergency exit lights, that don’t spill light onto the screen. 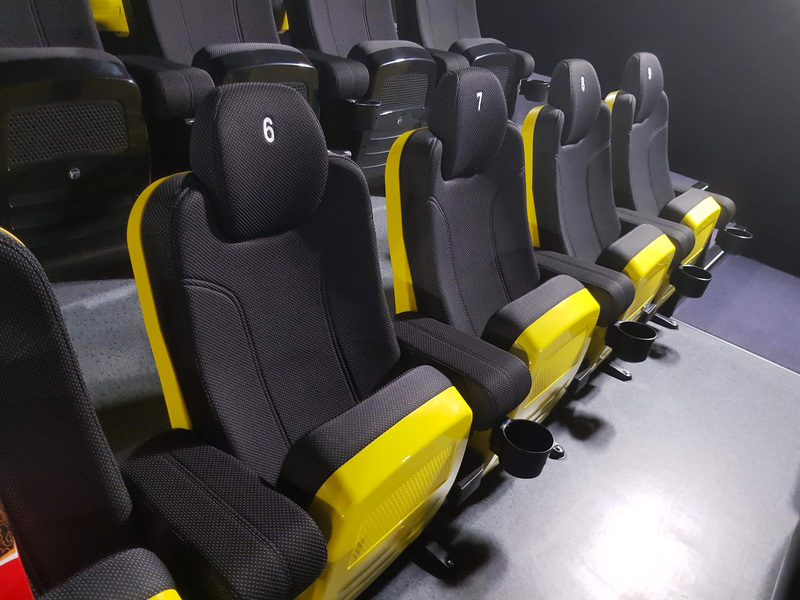 The regular screens have solid if unspectacular seating (by Megan Seating, a Polish manufacturer), with an unusual yellow back and bottom, colour scheme, giving the room a beehive bumble-bee feeling. The back row had love seats. Both projection and sound quality for the film shown (“Deadpool 2”) was of high standard. The adverts included ones for local events such as a beer festival and Catholic youth gathering, as well as for streaming service (!) HBO Go. Helios is clearly not afraid of any ‘Netflix and chill’ sentiments diverting attention from the experience it offers. In addition to regular screenings Helios runs a series of special schemes across its network of cinemas. These include Ladies Night, Film Night Marathons (“Sicario” and “Sicario 2”), Connoisseur Cinema, Matinee and theme-based screenings. As part of its Accessible Culture the chain also screens Polish films on Thursdays for just PLN 10 (USD $2.66 or EUR €2.28). 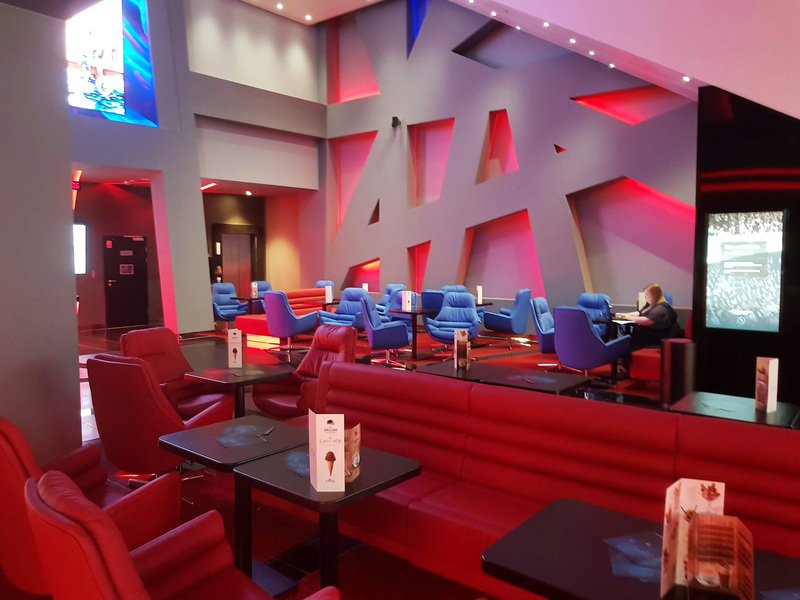 Yet while the downstairs part of the cinema is everything that you would want from a modern multiplex, it is the upstairs level that figuratively and literally takes Helios to a new level. 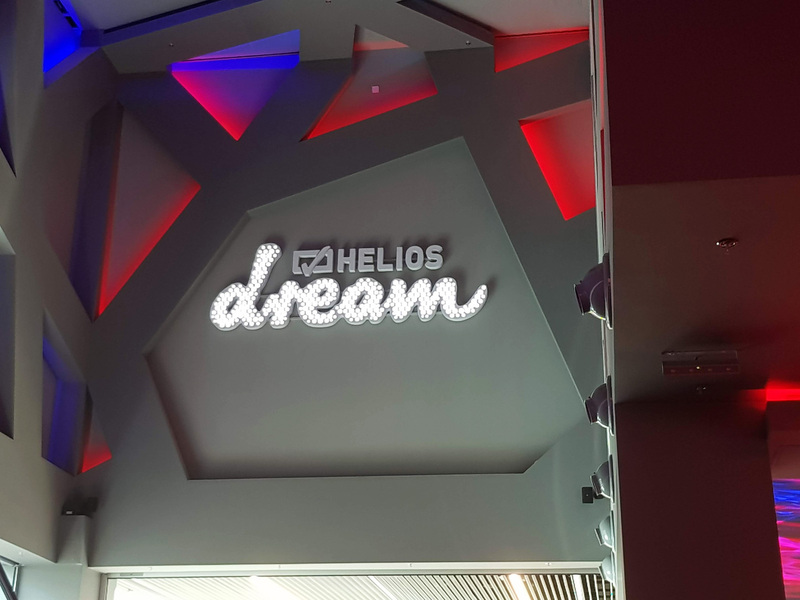 Situated above the main cinema, Helios Dream is the first time that Helios has launched a VIP auditorium concept within a new multiplex. The two screens are located above the rest of the screens and foyer, accessible via a long escalator. 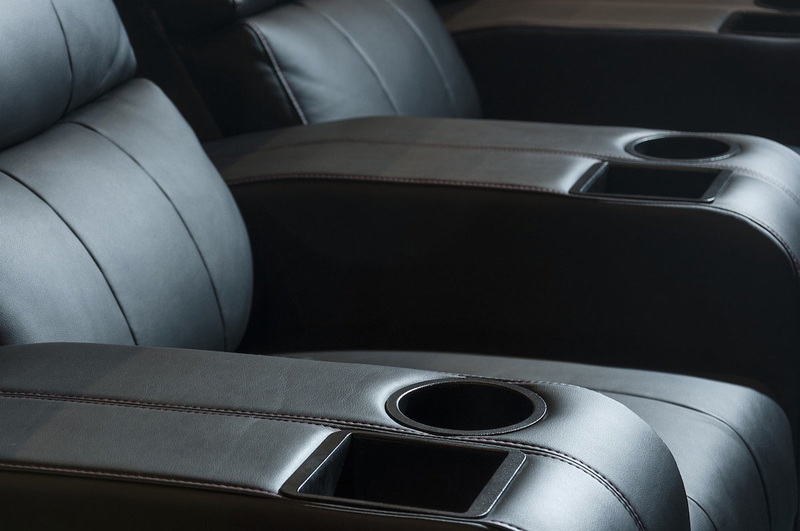 Each of the two auditoriums have 50 electric recliners with arm rests that have both a round and square hole; one for drinks and one for popcorn (popholder™). 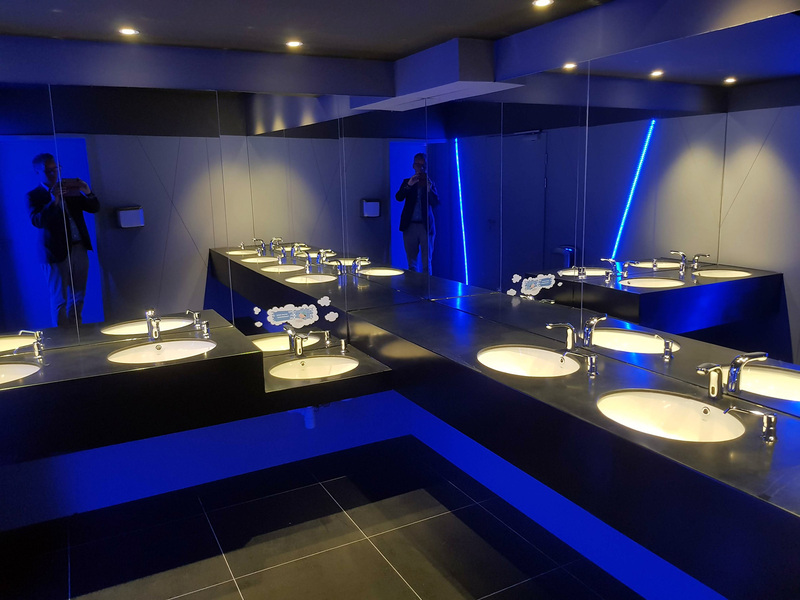 Audio-visually there is 4K laser projection from Christie Digital as well as 3D enabled by a DepthQ polarisation modulator, and Dolby Atmos audio. 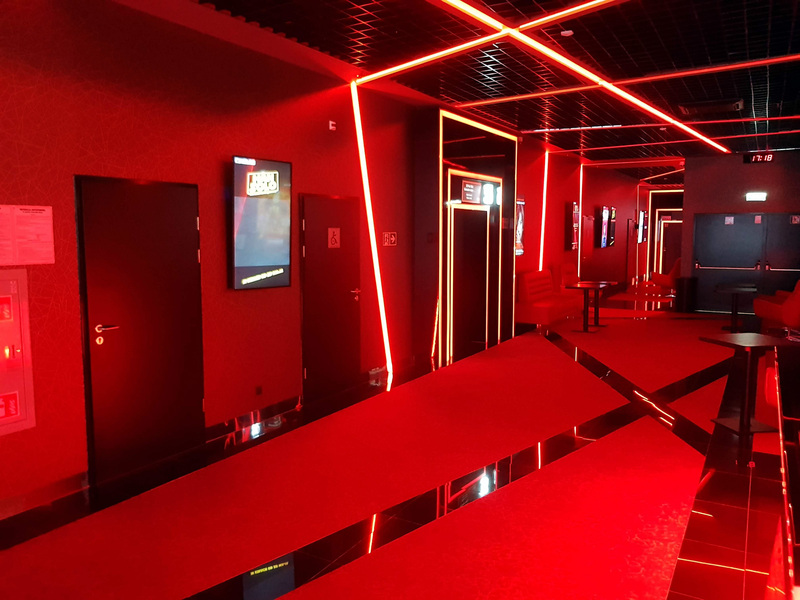 The cinema is thus one of the most highly specced in all of Poland, but Helios is set to include the Dream concept in future builds and possibly retrofit some existing sites. 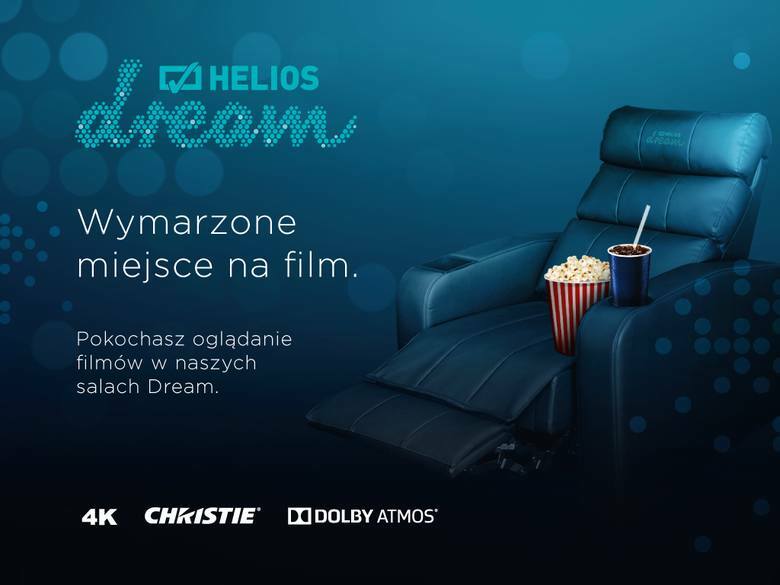 Tickets to Helios Dream only cost an extra PLN 5 (USD $1.33 or EUR €1.14), which is a relatively small upcharge for a VIP screen. As Helios says, “This is comfort that any cinema lover can afford.” Sadly on the day that we visited the cinema we were unable to access the Helios Dream screens as it was the grand opening and premiere of Polish Cannes award-winner “Zimna Wojna” (“Cold War”). It seems that Celluloid Junkie’s invitation tickets must have got lost in the mail, but we vow to return to visit it next time we are in Trojmiasto. Forum is not the first Helios cinema in the tri-city area of Gdansk-Sopot-Gdynia. 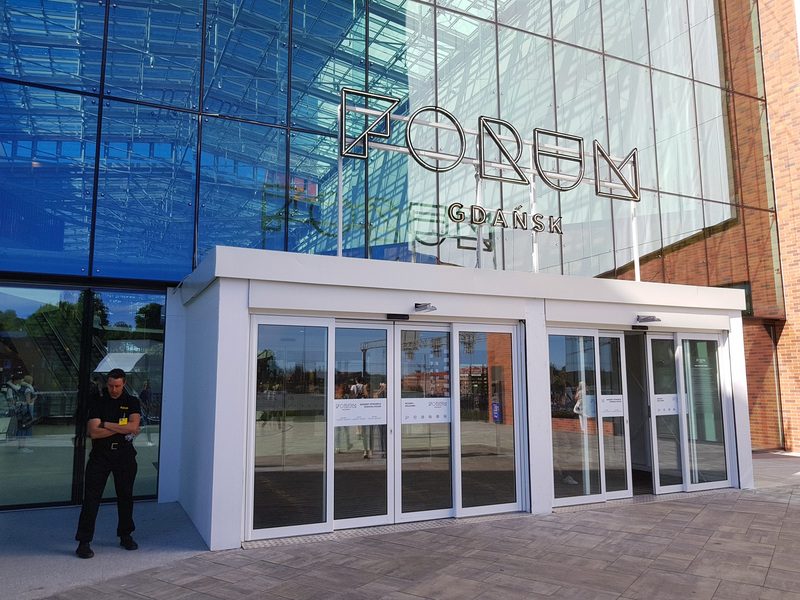 Nor is the market deprived of multiplexes with flair and personality, such as the Multikino Sopot where the excellent 45th Polish Cinemas Forum was held at the same time as the grand opening of the Helios Forum. 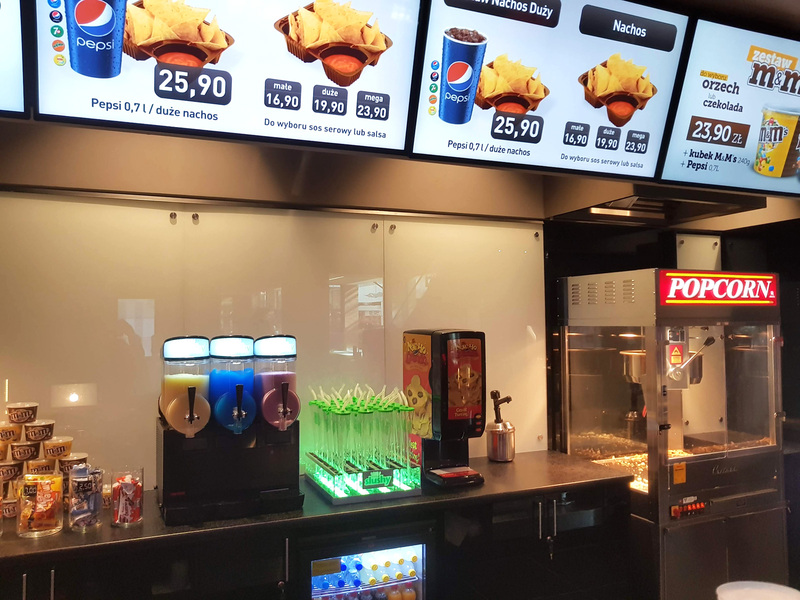 But it represents the interesting trend of VIP cinemas to a fast growing market but where the average ticket price is still just EUR €4.5. If it can get uptake for Helios Dream at just a 25% up-charge Poland will cement its position as one of Europe’s most dynamic cinema markets.